I absolutely hate junk mail. I cannot stand forwards even more, but my wife actually sent me one a while back that caught my eye. And, I just had to share it with you all. Of course I am not going to spam your inbox…so, let me just paraphrase a little bit of the e-mail for you and spare you the passing it on to ten other people part. 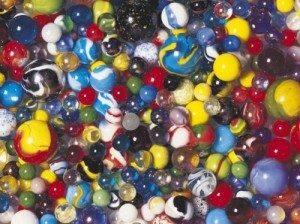 The e-mail is called “3,900 Marbles”, and you will see why in just a second. The average person lives about seventy-five years, some live more and some live less, but on average most people live to be about seventy-five years-old. So, multiply 75 times 52 weeks in a year, and you came up with 3,900. 3,900 is the number of Saturdays that the average person has in their entire lifetime. So, the average forty year-old person has already lived through over 2,080 Saturdays. A forty year-old only has about 1,820 Saturdays left to enjoy. The e-mail went on to tell the story of a man who went out and bought a bunch of marbles (1,820 to be exact). He took them home and put them inside a large, clear plastic container right on the kitchen counter. Every Saturday since that day, he takes one marble out and throws it away. Watching the marbles diminish will make you focus more on the really important things in life. There is nothing like watching your time here on this earth literally run out to help get your priorities straight. So, this holiday season, I hope that we all can take a step back from the hustle and bustle of our crazy world and crazy economy to be thankful of our blessings and to keep our priorities in order. Merry Christmas….